Earth is full of surreal places. Travel junkies who are looking for mysterious and surreal places and are looking for something adventurous as well should have Darvaza Gas Crater nicknamed ‘The Door to Hell’ on their travel wish list for sure. 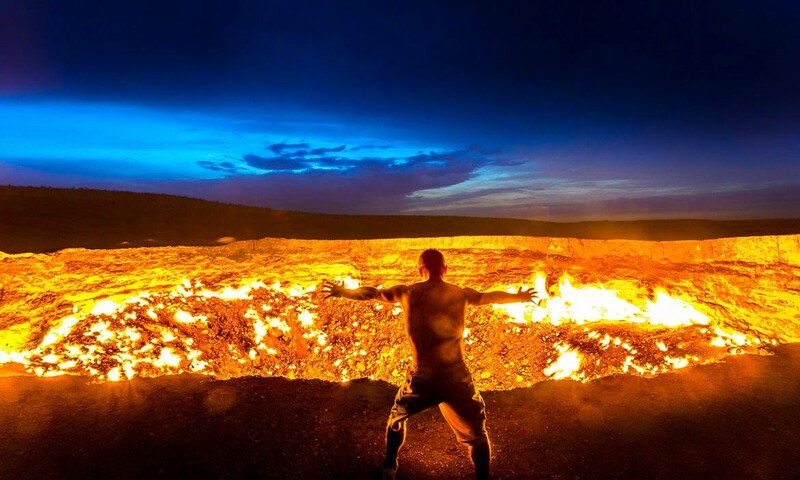 Located deep within the Karakum desert in Turkmenistan, Darvaza Gas Crater is a giant and eternal burning pit of fire which is burning since 1971. The perfect contrast between the serene, clear skies and depths of fire, Darvaza Crater is certainly a sight to behold. 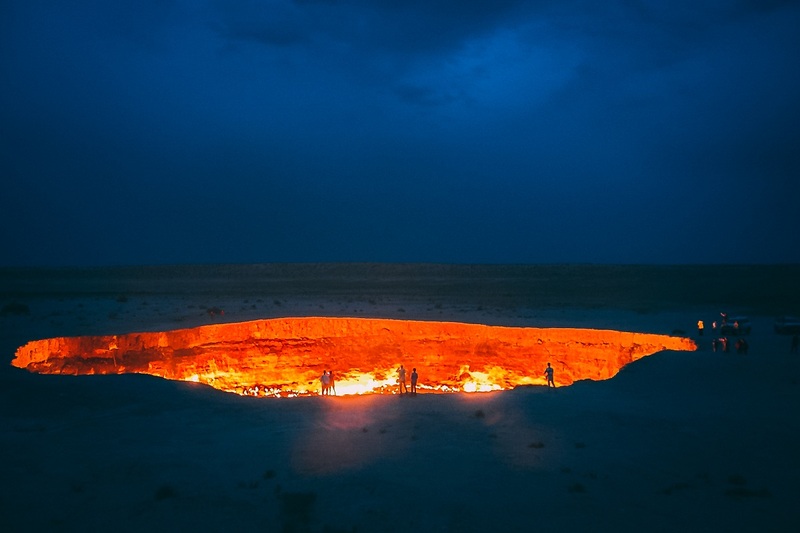 The Darvaza Gas Crater is incredibly spread over 69 metres wide and 30 metres deep with constant flames. It has been burning for almost half a century, and scientists who are monitoring have no idea till when the crater will stop flaming. Attracting hundreds of tourists every year, Darvaza Gas Crater can be considered as one of the eeriest places on the earth. It was found that the entire area of the Karakum Desert is rich in oil and gas by Soviet geologists. In 1971, when Soviet engineers were drilling on the location of the crater in search of oil field, they discovered a natural gas pocket instead of an oil basin. Soon, the thin upper crust that had formed over the gas pocket crumbled and the pit appeared. The site collapsed due to the heavy weight of the machines. Soon, it started leaking natural gas – mostly methane which is non-toxic yet hard to breathe. Just 5 percent of Methane in the air can cause an explosion. The high levels seeping from the crater could have caused a major disaster. In order to quick fix the expected disaster and to suppress natural gas, scientists set the crater on fire (called ‘flaring’). Geologists in the Karakum thought it would be a few-week burn but it doesn’t look like its stopping any time soon and is continuing till today. Take a flight to Ashgabat International Airport to reach Darvaza which is 160 miles away from Ashgabat, Turkmenistan. Note: Pre-book a tour to explore ‘Door to Hell’ as well as other nearest attractions of the country. Tour itinerary includes from picking you at the airport, sightseeing of different attractions like mausoleums of Turebek-Khanym, Sultan Tekesh, Sultan Il Arslan, Najmad-din-Kubra, etc. Camp out in the empty desert during the night to experience the best in the middle of the desert. Canadian adventurer named George Kourounis was the first to descend into the crater in 2013. Are you ready to see what hell looks like?